This shiny silver confetti says L'Chaim in both Hebrew and English along with some wine or champagne bottles and a few glasses. The English word is 1 3/8" long by 3/8" tall (3.5 cm x 1 cm). 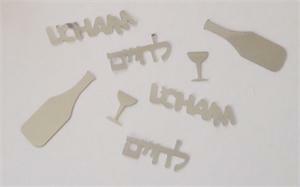 The Hebrew L'Chaim is 1 1/16" long x 1/2" tall. Price is for one bag. If used to sprinkle around centerpieces, one bag does 2 1/2 tables. Only 6 bags left.